“Trust - M ”Balance System"
BODY WEIGHT SUPPORT SYSTEM "BIOKINEKT"
The system is equipped with a self-contained wearable unit for long-term registration of bioelectrical activity of the brain. The system is intended for long-term cycles of neurophysiologic studies of electric activity of the brain with 24-hour monitoring capabilities. The traditional method of routine EEG registration often doesn’t allow for determination and differentiation of neurological disorders due to the limited duration of the procedure, which as a rule doesn’t exceed 20 minutes of registration. Thus, more than 85% of neurological disorders remain “behind the scenes”. The Neuropolygraph system’s 24-hour monitor solves this challenge. The self-contained wearable unit with internal memory data writing capabilities makes it possible to continuously register a patient’s electroencephalogram and biosignals for up to 48 hours. The ergonomic construction of the amplifier is secured to the patient with an ordinary belt to which an electrode EEG system and polygraph sensors are connected. The unit’s small size and light weight allow the patient to move freely during waking hours and sleep comfortably at night. During this time, all of the patient’s parameters are continuously recorded on a memory card for further detailed study and analysis. The self-contained unit is ergonomic, compact, and equipped with a built-in multifunctional lighted LCD display with an event button with the ability to transfer data via Bluetooth interface. The hi-end biosignal amplifier provides high-fi recording of EEG signals. The built-in electrode impedance control system provides on-the-fly detection of a bad contact and elimination of the problem. The ability to connect exterior provoking photo-audio stimulators and the uniqueness of the function allows one to use the self-contained unit in a wide range of tasks, including video monitoring and routine EEG. This advanced software, which works on Windows and Linux OS, is supplied with the system. The basic software package makes it possible to perform the following: adaptive filtering of signals, editing and re-editing of recording, amplitude, spectral, bi-spectral, coherent and wavelet analysis, showing results in the form of charts, trend lines, tables, histograms and mapping, forming computer-assisted conclusion on the study results, storing study results in the patient database, exporting to standard file formats of analysis and EEG review. The primary advantage of the daily EEG monitoring technique is long-term recording of brain biosignals. In routine methods, the duration of electroencephalogram recording does not exceed 20 minutes, which is usually too short to identify and differentiate pathologies. As epileptologists show, 85% of neurological disorders remain “behind the scenes”. Thus, when making a diagnosis, physicians cannot see paroxysm in a patient and must rely only on anamnestic data. Sometimes it can be difficult to take a patient’s medical history due to the complexity of the verbal interpretation of the event by the patient or their family. Patients often forget the event due to loss of consciousness during an epileptic seizure. There is also the similarity in clinical manifestations of various seizure types and non-epileptic conditions. Together, this can lead to misinterpretation of the data and an incorrect diagnosis. 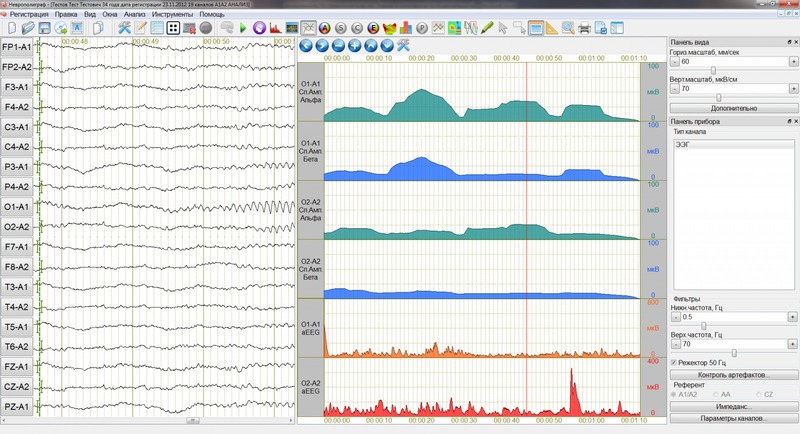 Long-term EEG monitoring with the Neuropolygraph system allows the doctor to obtain the most detailed information about the patient's condition. The synchronous video monitoring system option allows you to see the complete picture of pathological abnormalities with further determination of the nature of the event. The registrar is made as an ergonomic portable unit with a 10–20 or 10–10 system of electrodes that are included in the system kit. After placement on the patient and activation, the portable module produces a continuous daily recording of brain electrical activity similar to Holter monitoring. All data is stored on the installed SD memory card. The registrar is completely autonomous and battery operated, which allows the patient to move freely around the room and to realize a close to everyday life cycle. During daily monitoring, the doctor, if necessary, can check the quality of the recorded signal, the impedance of the electrodes, and the state of the batteries using telemetry, which is very convenient. The Hi-End biosignal amplifier provides high-quality recording of EEG data. 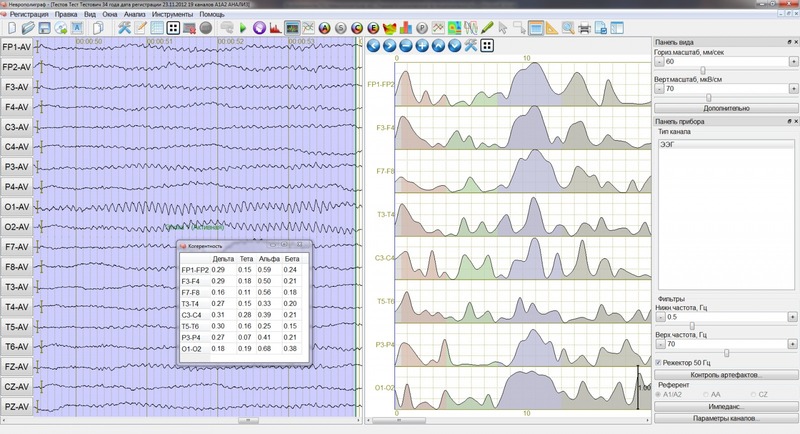 The Neuropolygraph autonomous registrar system has the ability to connect external stimulants and modes of provoking tests: rhythmic photic and auditory stimulation, hyperventilation, and sleep deprivation. In addition, it is possible to connect polygraphic sensors in order to record ECG, EMG, SpO2, and respiration to the system. The originality of the Neuropolygraph system parameters provides functionalities comparable with stationary systems of expert class. After completing the examination, the doctor can remove the SD card from the registrar and install it in the PC for detailed data analysis. 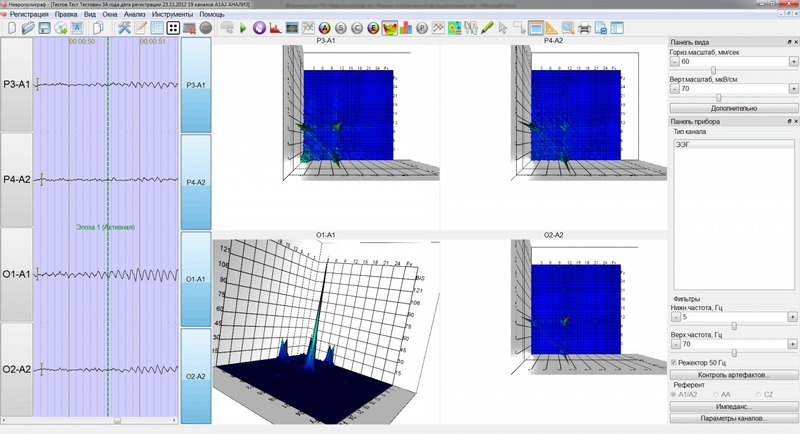 The ergonomic software included in the system allows the user to delete artifacts, to identify abnormal areas, to calculate parameter trends, and to make a conclusion in an automated method. It is very convenient and effective during working with long-term recordings. Routine EEG examinations are carried out in the relaxed awareness state – a patient is seated in a comfortable chair with eyes closed. Duration of the examination is 20-30 minutes. An elastic cap with bridge or cup electrodes is used as an electrode system. The electrodes are placed on the head in accordance with the international pattern 10-20. To increase the detectability of epileptiform activity using the “Neuropolygraph” system, different functional tests are carried out – with opening and closing of eyes, with photostimulation of different frequency, with hyperventilation (deep breathing for 3-5 minutes), audiostimulation. If needed, tests with motor and mental exercise are carried out. Longtime EEG monitoring, video monitoring, methods of longtime recording (8-10 hours) of patient encephalogram simultaneously with video and audio recording. Duration is the main advantage of the method since during routine EEG examinations (20-30 minutes) often it is impossible to differentiate epi-activity. Also the procedure is very important for the diagnosis of epilepsy in children. The manifestation of epileptic seizures in early age is particularly variable and obstructs their identification. The “Neuropolygraph” system has all the necessary technical software and ergonomic means for carrying out high quality longtime EEG recordings. Polysomnography- the complex process of monitoring and recording of physiological parameters during sleep. The technique is the gold standard of examination in somnology and allows for the making of accurate diagnosis in most cases of somnopathy. Polysomnography is used in the diagnostics and study of such diseases as insomnia, bruxism, narcolepsy and in sleep periodic limb movement disorder. The number of apneic episodes and heart beats are the key indicators in patients affected with snoring. Induced potentials present EEG recorded bioelectric reactions by different divisions of the central nervous system – cerebral cortex, brain stem or even spinal cord to a certain physical stimulus (flashing light, sound, rotating chess pattern or weak current discharge). From the results of such diagnostic stimulation, it is possible to assess the condition of optic, acoustic or somatosensory pathways. The method of induced potentials makes it possible to define, more accurately, the functional and organic nature of sensory disorders, for example, during differential diagnostics of hysteric amaurosis and true blindness. Using this method, it is possible to control the process of brain surgery, when a patient is unconscious, which helps to avoid nerve damage during surgical interference. Induced potentials are widely used for diagnostics of disseminated sclerosis and other severe organic diseases of the nervous system. • Export and import of data to external software packages. • perform synchronous recording of audio-video data. • removal of artefacts (ECG,EMG). 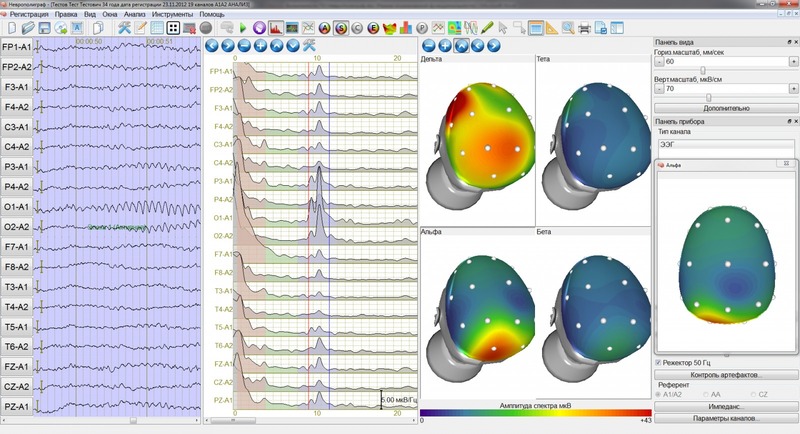 EEG amplitude mapping is one of the modern methods of mathematical processing of encephalographic curves with subsequent development of maps of instantaneous distribution of potential difference over the surface of the brain. Amplitude mapping allows for the determining of the topical assignment of the components of averaged induced potentials or potentials associated with events reflecting the participation of different cortex divisions in information processing and also studying the neuronal mechanisms of cognitive and motor functions. The method is particularly effective for the evaluation of dynamic processes of bioelectric brain activity, mainly connected with epi-activity. The analysis of the amplitude maps reflecting the potential distribution in specific time intervals, makes it possible to obtain clear presentation of the origin of the phenomenon of interest, its distribution over the surface of the brain and dynamic changes of the process. During mapping local regions are detected in which epileptic discharges occur, which are hard to detect by traditional EEG reading. Such analysis gives additional useful information and makes it possible to predict more accurately the treatment results and the course and outcome of epilepsy. For example, amplitude mapping has been very accurate in the diagnosis of so called “benign epilepsy” with the focus in the area of the Rolandic fissure, thus isolating this variant from others which often have less optimistic prognosis. Rolandic epilepsy mainly occurs in children of 2-14 years and on reaching the age of 16 spontaneously subsides in 98.8% of patients. Currently 3D amplitude mapping is considered to be the most effective way to diagnose this. EEG Spectral analysis is intended for in-depth study of the frequencies of EEG recorded bioelectrical impulses above the brain surface. So called power and amplitude of frequency characteristics of EEF biorhythms over a particular period of time are used as the main criteria of spectrogram analysis. Such an approach makes it possible to evaluate the ratio of different rhythms within the EEG and most significantly to detect the frequencies which are not determined during visual analysis because of their small amplitude or on account of shielding by other rhythms. 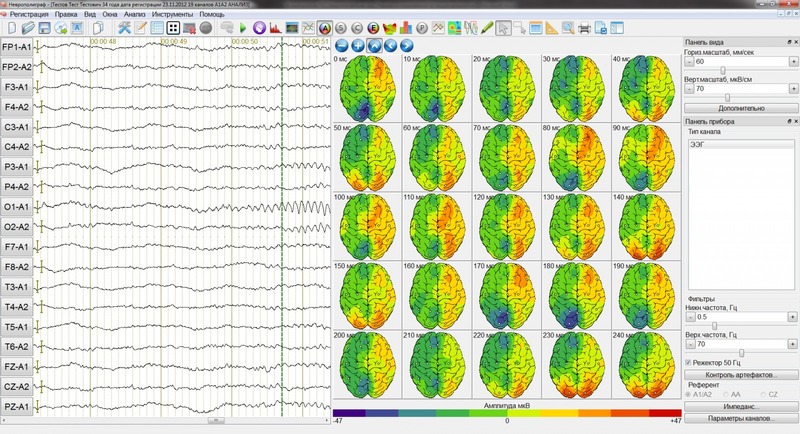 EEG spectrum power analysis is based on the fast Fourier transform method. At this time, some important common factors of EEG spectrum power distribution are known. For example, the EEG power spectrums of cortex anterior regions of healthy men have more complex nature than posterior ones which apparently is associated with mental activity and implementation of other cognitive psychical functions. In the frontal-central parts of the brain the powers and frequencies of delta, beta, theta rhythms dominate and in the posterior parts of both hemispheres- the power of alpha frequencies prevails specific for the state of relaxation, enervation and drowsiness. In the EEG spectrum of brain pathology, which lie outside the norm for different ages and patient conditions( age and conditions e.g Asleep awake)depending on the localization of pathological process and brain damage level. Spectrum calculation is made for the selected montage for one or several epochs of the analysis of arbitrary duration. Each frequency range can be marked with its own color. Spectral analysis settings allows changes to be made in the number of Fourier transform points, weight window type and spectrum smoothing coefficient. Spectrum analysis data is collated into several types of tables i which show the levels of amplitude, power and instantaneous values of the spectrum in the selected frequency ranges. It was found that in early infantile autism there is a higher delta rhythm power with simultaneous decrease of alpha-activity and also abnormal distribution of alpha and beta rhythms and levelling of hemispheric asymmetry. During logoneurosis the power of alpha activity in the posterior parts of the left hemisphere and anterior parts of the right hemisphere significantly increases. In healthy men, while listening and repeating phrases, the desynchronization of alpha-rhythm in the posterior regions of the left hemisphere and in patients with logoneurosis – of the right hemisphere. In healthy men, when activating imaginative thinking, alpha rhythm power increase was found only in the left hemisphere and in stuttering patients it was found both in the left and right hemispheres. Using EEG spectral analysis in depressive patients, the lengthening of REM sleep cycles can be found with simultaneous shortening of the latent time of their emerging and also the decrease of delta and increase of theta activity, and also the smoothening of the palpable differences in spectrum power between sleep and wakefulness phases. During latent depression, the asymmetry of EEG spectrum power indicators during REM sleep stage is registered and also more powerful spectrum of all frequencies of the biorhythms in the right hemisphere in comparison with the norm. During Alzheimer’s disease, the power increase of delta and theta rhythms and the decrease of alpha and beta activity are found. Spectral Mapping. Any neurophysiological study is primarily a topical diagnostic tool, the main task of which is the search of the source of neuron abnormal or paroxysmal bioelectrical activity on the surface of the brain. For this purpose, on the basis of spectral analysis a method of spectral topographic mapping was developed, combining two complementary approaches: quantitative analysis of encephalographic curves in amplitude-power indicators and visual analysis, wherein topographic maps reflect the activity of the brain neurons in accordance with a specified color scale in the form of 2D or 3D image. The building of the topographic maps of distribution of amplitude-power characteristics along the convexital cortex surface is possible on account of having a number of EEG recording channels; the possibility of dynamic analysis in several epoch is provided. Coherent analysis. The term “coherent analysis” derives from Latin words “cohaerens” – connected and “cohaerere” – to be connected. In modern science coherence means the consistency of running processes in time. The coherence of brain electric signals is the quantitative indicator of the synchronism of involving of different cortical zones during their functional interaction providing the integrative activity of brain structures. Since brain electrical activity is closely associated with its functional activity, coherence indicates the involvement of different cortical zones in providing brain function performance, it other words it is the quantitative representation of the integrative activity level of brain structures. Coherence reflects the degree of consistency of the functional interactions between different cortical regions. The integration level of the cortex regions should be adequate for optimal performing of functions. The values of coherence vary from 0 to 1. In this case the higher coherence value the more consistent the activity of a region with another. One of the main advantages of the coherent analysis is the independence of coherence coefficients from the signal amplitude of different brain regions. However, the use of the coherent method of EEG processing is limited still mainly to scientific purposes on account of the complexity of the process of bioelectrical signal processing which requires the use of complex mathematical equipment. But today, thanks to rapidly developing digital technologies the problem is being solved. Coherence calculation is made by one or several periods. In order to perform coherence calculations a random set of pairs of montage leads are selected. The calculation results are presented in the form of coherence value tables in selected frequency ranges. Coherence mapping. A mapping method was developed on the basis of coherence analysis. This modern method of mathematical processing of electroencephalographic curves reflects the distribution of coherence coefficient values within the specified variability limits. During coherent mapping the number of encephalographic record channels is of great importance. The more the number of leads of an encephalograph the more information-intensive is the result of the coherent analysis. According to the world literature data, the coherent analysis proved itself in the psychology of developmental age and psychiatry. 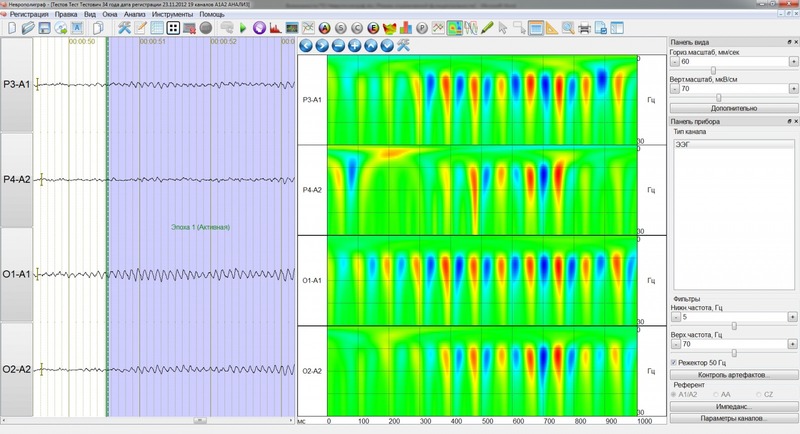 Today EEG coherent analysis is successfully used for objective assessment of the synchronism of the functional activity of brain regions for the purpose of development of differentiated diagnostic and treatment and rehabilitation programs which creates the realistic approaches to the high quality delivery of high-tech medical care. Trend analysis. For extended period recording trend analysis is used – the chart of a parameter change during the whole recording. 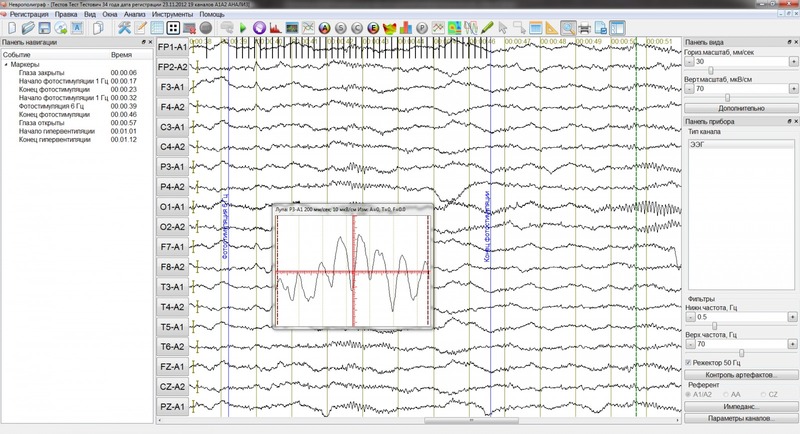 The “Neuropolygraph” program system allows calculations of the trends of amplitude, power, spectrum or coherence in the specified frequency range for the selected leads of an amplitude-integrated EEG, average and maximum frequency, amplitude and rhythm indices, amplitude and time parameters of polygraph channels, the number of sharp waves. The set of trend parameters – trend schemes- can be formed randomly and be kept till next use. Navigation in the trend window makes it possible to quickly go to the record area corresponding to the cursor. Correlation analysis. In the “Neuropolygraph” program system the correlation calculation is made in the specified time interval for pairs of leads (mutual correlation) or for one lead (autocorrelation). The correlation function is normalized by amplitude and centered relative to the average value. It has a range of values from -1 to +1. The correlation EEG analysis makes it possible to qualitatively assess the presence of interdependency, their strength and directivity between bioelectrical processes taking place in different brain regions, reveal common regularities in the occurrence of some or other variants of cortex neuronal activity. The current methods of statistical processing of quantitative EEG analysis makes it possible only to categorize the bioelectrical activity phenomena, assign them to periodic or aperiodic events and reveal the periodicity of their appearance. By contrast, correlation EEG analysis provides a method of dominant components of bioelectrical activity of brain neurons. The correlation analysis, that uses mutual correlation functions allows for weak bioelectric impulses to be shown. The cross-correlation EEG analysis, also called the mutual correlation method, makes it possible to determine the functional interactions between different cortex locuses. The period analysis is based on the measurements of periods between the characteristic points of encephalographic curves – wave tops, weak peaks or zero crossing. 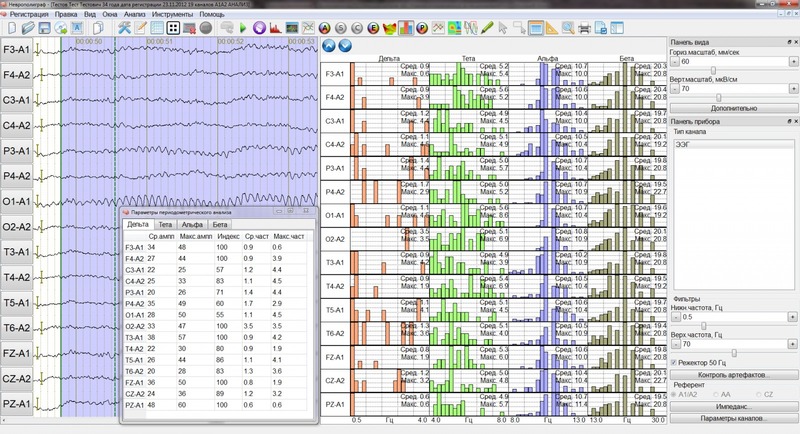 The period EEG analysis makes it possible to calculate the average values of wave amplitude, their confidence intervals, average wave periods and their dispersion, compute EEG rhythm indices with high accuracy based on the sum of all wave periods of the selected frequency range. 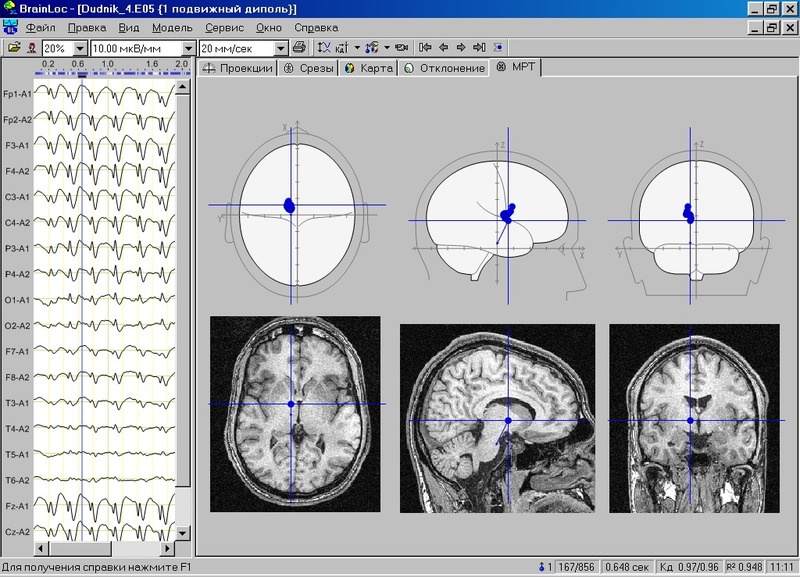 The prototype of the present type of mathematical EEG processing is the Fourier analysis. However, the period EEG analysis has a bigger interference resistance and its results depend to a far lesser degree on the effect of single high-amplitude events, for example, on interferences caused by the patient moving during the EEG. The period analysis is performed by one or several periods for all leads of the present electrode mounting scheme in the selected frequency range. Before starting the period analysis, it is necessary to specify frequency ranges and the averaging mode by selected periods. It is also necessary to specify the parameter type histogram-frequency or rhythm amplitude. Depending on this, the average and maximum rhythm frequency or the average and maximum amplitude and the rhythm index of an analyzed periods are displayed on the histograms. Mapping of parameters of periodic analysis The results of the period analysis can be represented in the form of maps of amplitude-time parameter distribution along the convexital surface of the cortex. This method of mathematical EEG processing shows the variability of values of the calculated amplitudes and periods of the bioelectrical impulse waves within the specified limits. During period mapping the wiring configuration of electrode placing and the number of encephalographic recording channels are also of great importance. The greater the number of channels an encephalograph has, the more informative the results of the period analysis. However, it should be taken into account that at this time no common standards for performing the period analysis and mapping have been finalized. 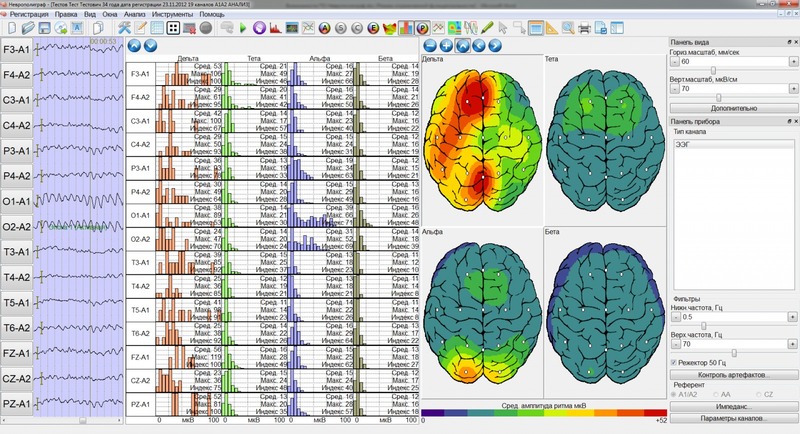 Bi-spectral and bi-coherent EEG analysis. The bi-spectral analysis describes the observations made at two EEG signal frequencies. The procedure of bi-spectral analysis includes the use of the phase information obtained from the fast Fourier ttransformation and the calculations of inter-frequency phase relations. It is used to look for evidence of non-linear signal interactions. All complex EEG signals can be divided into constituent sinusoids using the fast Fourier transformation. From each analyzed period three indicators are obtained – frequency, power and phase. The main parameter of the method is so called bi-spectral analysis, which adequately reflects the depth of general anesthesia. Anesthesiologists call this indicator “brain window”. To provide maximum speed of bi=spectral analysis in conditions of emergency medicine anesthesiologists use special electrodes which are applied using an adhesive glue. They provide high quality EEG recording, the mounting of the electrodes under 10 seconds. Today the bi-spectral analysis is fully adapted to take account of the effects of r anesthesia and became the standard practice in anesthetic care. 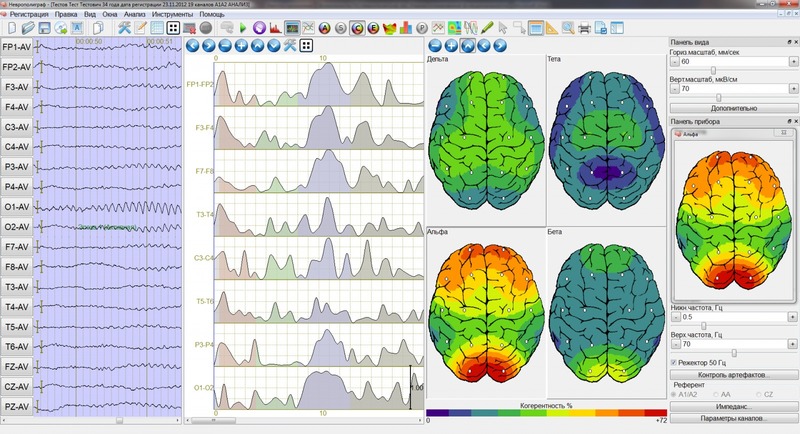 The bi-coherent EEG analysis is used for the study of interhemispheric phase relationships between low and high frequency rhythms in the range of 0.5- 30 Hz. It was found that these relationships are quite strictly determined by gender characteristics, the type of executed activity, temperature characteristics of a subject, intelligence quotient and lateral brain organization. Wavelet analysis provides a method of mathematical processing of encephalograms giving the ability to study the frequency components of bioelectrical impulses which function graph presents dampened waveform oscillations with amplitude tending to zero. In the course of the integral transformation of EEG curves so called wavelet coefficients. On the basis of the wavelet analysis the matrix of wavelet coefficients is built reflecting the proportion of one or another frequency in the spectrum of recorded biorhythms at a certain point. The wavelet analysis allows evaluation of the activity of transient bioelectrical processes in the brain. When used together with photostimulation it is possible to get fundamentally new data on the dynamics of amplitude-frequency indicators of an encephalogram. This makes it possible to determine the regularities of the unsteady EEG change during functional tests with photostimulation, hyperventilation, psychoemotional load etc. The advantages of the wavelet analysis lay in a) possibility of decomposition of bioelectrical signal structure into frequency and time components; b)analysis of short periods containing a small number of periodic oscillations; variability of selection of the basic parameters whereby bioelectric impulses are analyzed; effective analysis of noisy signals with the enhancement of a useful component and noise. Wavelet analysis has a large number of uses including but not limited to the the study of epi-activity, sleep and wakefulness phases. Independent component analysis(ICA) relates to multivariate statistics and presents the extension of the principal component method and factor analysis. Using the analysis any signals are decomposed into the form of the superposition of independent sources (components). In neurophysiology over several decades efforts have been made to improve the quality of EEG recording. It is important to remove noise from power supply and system noise, of myocardium electrical activity, all kinds of muscle contractions etc. Recently independent component analysis has been used in modern encephalographs as a way of detuning interfering noises and enhancing useful signal. 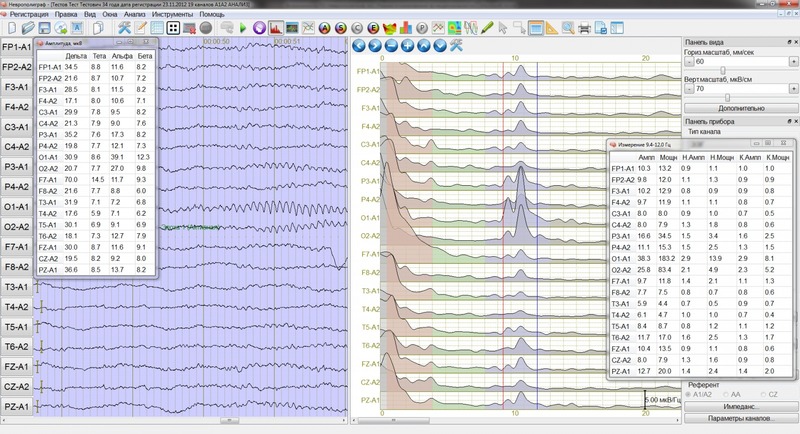 Using the program system “Neuropolygraph” the independent component analysis is performed by an active period for all channels of the wiring scheme of EEG electrodes. The analysis can be used, for example, to remove the results due to cardio, myo- signals or other origin. Program module for pathological source activity localization is used to detect the sources of abnormal electric activity of the brain, represented for any specific time in the form of one or several equivalent electric dipoles. 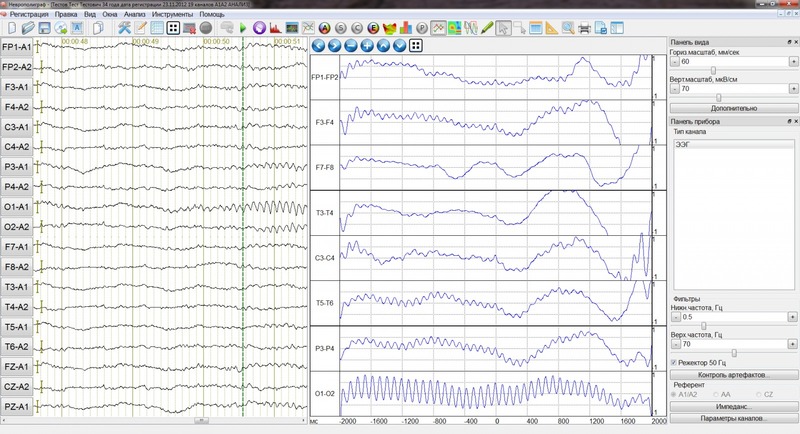 Single point amplitude values of multichannel EEG are used as input information regardless of the wiring configuration. For each analyzed time point the calculations of three dimensional coordinates and vector moments with a set number of sources, achieve 95% confidence intervals as well as the dipole coefficient characterizing the adequacy of the used model. The results are produced in orthogonal projections on standard section on the brain atlas or on the tomographic image of a patient’s head. The possibility exists for building amplitude maps of EEG potential distribution, potential maps for the dipole model as well as ECOG potential maps on the surface of the brain cortex.The program BrainLoc may be useful both in clinical practice, since it enables accurate visualization of abnormal focuses deep in the brain in the presence of tumors or epileptic activity (functional EEG tomography), and in scientific research, since it makes it possible to trace the dynamic motion of the electrical activity centers in the brain structures by different impacts, for example, mental load while recoding the induced potentials of different modality, during the study of the wave complex development dynamics, when investigating the sources of rhythmic activity generation in different frequency ranges etc.